The kitchen garden in February! There is still a good chance of rain, wind, sleet, snow and ice this month! Go easy in the garden, with a few gentle garden tasks on brighter days, to ease back into the outdoor life! A kitchen garden does need a little attention and planning, now and then, though. Even a virtually neglected vegetable garden will produce some home-grown edible greens, a few tomatoes and a handful of other simple fruit and vegetables for harvesting over spring, summer and autumn - with a little help. There are many options from the gardening calendar to keep the gardener busy! February can be a wonderful mix of ideas and light work (or heavy labour) – with an abundance of garden jobs to be found on any garden calendar. To get started, this month, here are a few jobs for the kitchen garden that can be done on an as-and-when basis during February. Edible vegetables will be as good as the soil they grow in! Whether or not you chit your potatoes, they will still grow! Visit kitchen gardens for ideas! Give the potting shed a makeover! Cut all the stems back to help them grow better! Clean up the paths with a jet-spray, or bucket and broom! Make sure native hedges are pruned well before the nesting season starts! 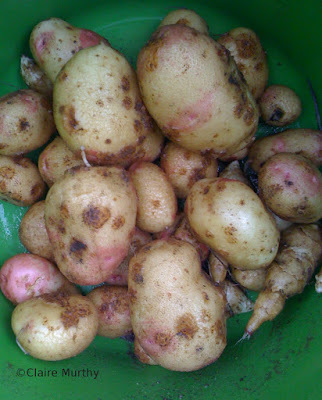 Kitchen Garden : February : Chit the potatoes. But, if getting back into gardening, after a rest, still seems like a tall order, then just a few light tasks can help keep things on track in the garden – visit a garden centre for a range of seed potatoes to grow locally, to take home and chit in time for spring weather!